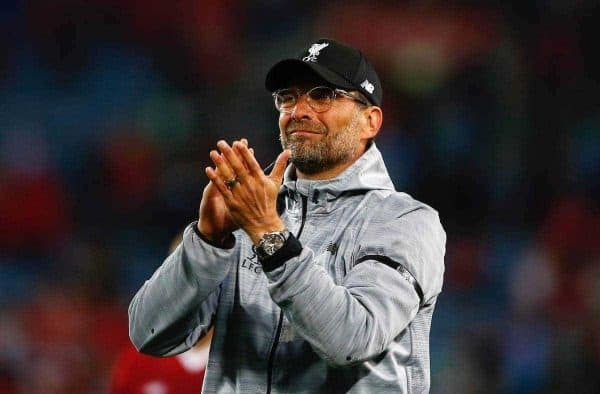 Looking back to look forward: comparing Liverpool’s recently finished campaign to previous years and what it means going forward under Jurgen Klopp. Now that the 2016/17 season is over and Liverpool have secured Champions League football for only the second time in the past eight years, it’s time to see how this campaign compares against previous ones. It has been the Reds’ sixth-best Premier League season in terms of points won, but how does it compare on other measures? A points finish in the 70s is a rare thing for Liverpool, for starters. Along with 2007/08, this season is the only time that it has happened in the past 20 years. It’s certainly been a rollercoaster two decades, as the fact that the Reds have had four points tallies in both the 50s and 80s in that period will attest. 16/17 was certainly one of Liverpool’s better campaigns on the road. They have only won more than 10 away matches twice since 1992, and only 2013/14’s better away goal difference puts this season into fourth place in the rankings. 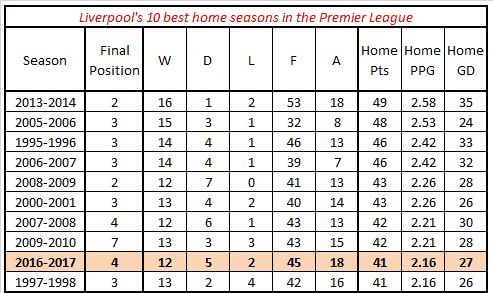 The form at Anfield hasn’t been so inspiring though, with points dropped in seven of the 19 matches. Far too many goals were conceded, with only five of the previous Premier League seasons seeing more opposition goals per game in L4. The previous two years were among those five though, so it’s a small step in the right direction at least. If we rank Liverpool’s scoring and conceding records across the last 25 seasons, 2016/17 is ranked second for goals per game scored, but a lowly 17th for goals conceded. It’s interesting to compare it with 2005/06, which had a fairly similar points tally. That campaign is ranked first for defence but only 17th for attack, so an almost-perfect mirror image of this season. It also illustrates Rafa Benitez’s blanket analogy perfectly: In football, you can focus at the front or the back, but it’s near impossible to be amazing at both. Based on this season, it’s fair to say Klopp focused on the more entertaining of the two options. One disappointing aspect of this season is how many points Liverpool have dropped from leading positions. The Reds have drawn six and lost two of the matches that they have lead in, and only four sides dropped more than 18 points. 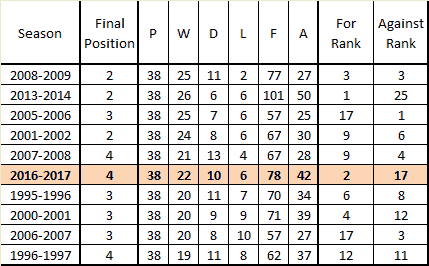 It’s important to remember though that Liverpool lead 30 times, and only Chelsea (with 34) bettered that. 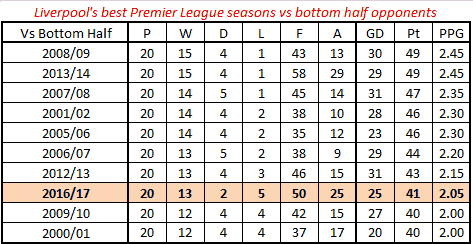 Klopp’s team still took 2.40 points per game when leading, which is far from catastrophic, but it is below the club’s 2.50 average from the last 20 years. 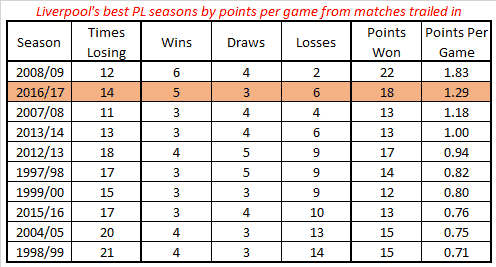 What’s more encouraging is Liverpool’s record at recovering points this season. The Reds recovered 18 points from losing positions, via five wins and three draws, and that was the most by any team in the Premier League this season. It’s the club’s second best total in the last 20 years (after 2008/09, when 22 points were recovered) and as many points were gained from losing positions as in 2014/15 and 2015/16 combined. All hail Jurgen’s resilient Reds. It’s also impressive that they’ve managed to turn so many games around considering that they haven’t been behind in games too often. 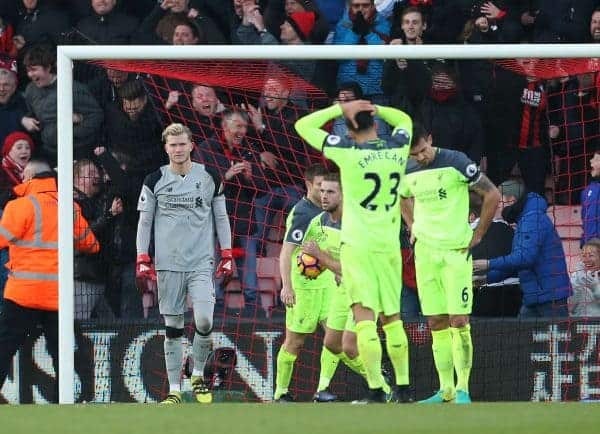 Liverpool’s total of 470 minutes spent losing was second only to Chelsea (457) this season, and in terms of club history, it’s their sixth-best performance from the past 20 seasons. As you’d expect, the record at the other end of the pitch is even more impressive. 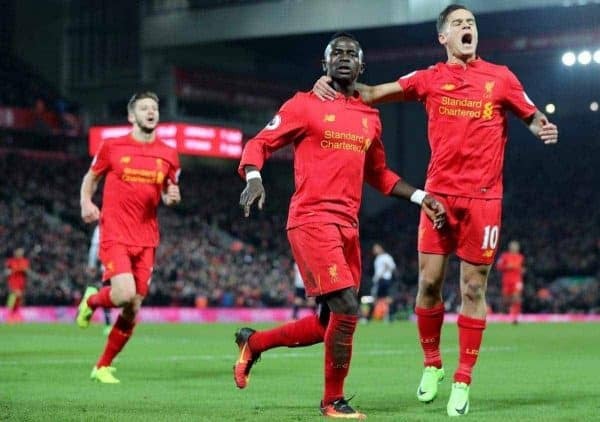 The Reds lead for a total of 1,390 minutes, which is the third-best tally both in the Premier League in 2016/17, and for Liverpool in the last twenty years. Of course, it’s more important to be leading at the end of the final minute of the match rather than for (as an example) 59 minutes as they did when losing at Bournemouth. Liverpool’s net figure of leading minutes minus losing minutes was 920 this season, and that’s in the top 8% of Premier League performances in the past two decades, which illustrates that Kopites have had far more to enjoy rather than be miserable about during matches this season. That said, some people spend the time spent leading assuming it will go wrong, but what can you do about them? Fans will, of course, know that Liverpool’s record against the better teams has been excellent, and even in the context of their record in the Premier League era it is right up there. The Reds’ total of nine wins, eight draws and just one defeat against sides who finished in the top half of the table matches their efforts in 2013/14 and 1995/96 as their joint-third best season. 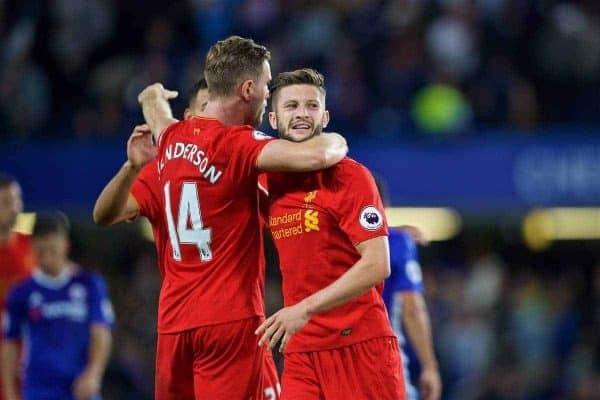 It’s the lower half teams that have proved more difficult—but surprisingly 16/17 was not one of the Reds’ worst seasons on this front: There have been seven better and 17 worse campaigns since the formation of the Premier League. Liverpool get a grade of ‘must try harder’ for this section, but it should be easier to fix than if they struggled against the very best teams. 2016/17 has been a season of progression from the one before, and that’s the main thing all Reds fans would’ve wanted at the start of campaign. If Klopp can tighten up the defence, particularly against the lesser sides, then 2017/18 might just be very special indeed.